It was a storm of epic proportions. For three tidal cycles, the waves pounded Gooch’s Beach in Kennebunk, breaching and eventually destroying the seawall, lifting boulders onto the road and into the yards of the houses along Beach Avenue. Homes were flooded, roads were impassible, seaweed and beach detritus littered lawns and porches. Now known as the Patriot’s Day storm, it was a Nor’easter that drove up the eastern seaboard in April 2007 and hit the Maine coast with a terrifying ferocity not seen since 1991. In the aftermath, residents struggled to deal with extensive damage from waves, wind, and rain. At least one house emerged from the tempest virtually unscathed. Sea Rose Cottage, which was in its final stages of completion, was the beneficiary of recently instituted town ordinances governing new home construction along the Kennebunk shoreline. The elegant ocean home proved that innovative technology, thoughtful construction, and a respect for the power of the elements could combine to create a house that will stand the tests of time and nature. Sea Rose Cottage, located at the northern end of Kennebunk Beach, is Beach Avenue’s most recent addition. Michael and Stephen Spenlinhauer, the father-son principals of Seaport Development Group, first saw the lot and its former house, a 1960s-vintage ranch, in 2005. They were excited by the spectacular location, but as prudent businessmen they waited patiently to make the deal. “We visited over and over again,” says Michael Spenlinhauer. “I loved watching the boat traffic go in and out of the breakwater, watching lobster boats motor from trap to trap. The views from this property were mesmerizing.” Finally, in September 2006, they closed the deal and began the process of taking down the old house and building the new one. Their goal was to create a home that straddles two eras, by incorporating the charming design details of the 19th centur y with the engineering and technological innovations of the 21st. Kennebunk-based and Stanford- trained architect Harvey Wells designed the house with a long, graceful silhouette that followed the contours of the narrow lot. He was inspired by the architecture of the old hotels that sprang up along the Kennebunk coast during the 1800s, many of which exist today only in faded postcards or in dimming memories. 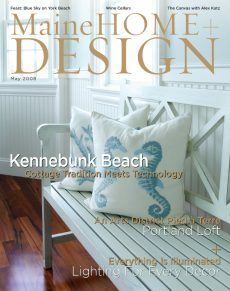 Each step in the design of the Shingle Style home was informed by ocean living at its best and most challenging. to extreme weather. The residents of Beach Avenue have come to regard flooding and general storm damage as part of the price they pay for living in the midst of such natural beauty. Utilizing innovative engineering breakthroughs and working within the parameters of strict building codes and Department of Environmental Protection guidelines, Wells set out to create a house that is virtually storm-proof. He enlisted the aid of geotechnical engineer Lisa Caselli, of Geotechnical Partnership, Inc., in Sanford, to help him in his quest. To mitigate the effects of errant waves, Sea Rose Cottage was built on huge concrete piers that elevate the entire structure three feet above ground level. Because the land beneath the house is somewhat unstable, the piers are anchored to a massive concrete pad that was poured six feet deep to provide a stable foundation. Storm-generated winds can also create problems unique to oceanfront living. The long, narrow configuration of the building, which gives each room its magnificent ocean views, also acts as a giant sail in a storm, increasing the home’s vulnerability to wind damage. Wells called in structural engineer William Koutalidis of Group Design in Saco, who designed parallel steel support beams that run the width of the home, rendering it practically impervious to even gale-force winds. Wells’s engineering and architectural solutions were thoroughly tested during the Patriot’s Day storm—the result exceeding all expectations. Seawater from the storm surge passed harmlessly through the decorative trellis obscuring the piers, and the interior did not see a drop of water. Winds of over 75 miles per hour had little effect on the house itself. Working with the Spenlinhauers, Wells configured the lower level of the home for vacationing and family living. The kitchen and dining room were located in the heart of the house, flanked on either side by a family room and living room. There is an outdoor shower near the back entrance so that guests and family members can come in from the beach, shower off, and take the back stairs to the bedrooms on the second floor, easily avoiding the more formal living spaces. In spite of the casual nature of life at the beach, the Spenlinhauers wanted the finishes in Sea Rose Cottage to be of the highest quality. Builder Kevin Lord, of Thomas and Lord, set up an on-site workshop where his crew created the custom millwork for all the trim, from the crown molding to the windows and mantles, fashioning details of a bygone era throughout. Lord’s painstaking attention to these details makes the house feel as though it has been there for generations. The second floor of the home reinforces a feeling of stepping back in time; here is Sea Rose Cottage at its most traditional. The expansive master suite and three bedrooms, each with its own bath, open onto a long, graceful hallway that recalls another era. Sarah Steinberg, of Steinberg Custom Designs, created bathrooms of luxurious beauty and timeless elegance that incorporate modern amenities at every turn. Sea Rose Cottage is the kind of home that invites tradition and history into its rooms, a house that can only be fully appreciated when it is filled with the sounds of laughter and family activity. It represents the best in local design, craftsmanship, and ingenuity in a setting that speaks to anyone who has ever fallen in love with the Maine coast.